Thanks Nhibbo. A greenhouse does get me thinking. Does anyone know how long fibre cement sheeting will last in the ground? Im thinking of using it around the ibc cage before putting it in the ground. Don't know if it's 100% needed, but the better safe than sorry path is a smooth road.. I would think fibro sheeting will last a LONG time, look at super 6 fencing that's been used for decades. Not a lot of progress this weekend. Ive settled on wrapping the sump cage with coreflute mainly because its cheap. I'm using an old pallet temporarily to keep junk falling into the sump tank until i construct a proper lid. I am going to start the system with just one tank 2 filter barrels (rff and mbbr) 2 growbeds and the one sump tanks. This will let me transfer the fish into this system then use the old one for parts for the remaining components. Ive got the first fish tank and grow bed leveled. Next will hopefully be the drain line from the grow bed to the sump. Does anyone have a recommendation on the slope for my drain lines? Tagging along for the ride. Need some new inspiration so excited to see how this turns out. Any fall is adequate in a straight line and in a backyard situation. Having low spots could create anaerobic areas. Is this a problem? Prolly not small scale. My advice would be to, if it's possible, have a drain at all of the lowest points for a flush point..
Its been a while since I have posted an update. The system has just finished cycling. I added 250ml of powerfeed approx 3 weeks ago. Today's test for Ammonia and Nitrite have come back as 0. Would it be worth moving my fish over to this system now or should I dose up with some more power-feed first? 3 weeks seems short? I think i recall seeing 4-6 weeks if the temperature is in the right zone for the bacteria? Maybe add enough powerfeed to get an ammonia reading and see if it converts within the day. Moved 6 silver perch over to their new home. Id estimate they are a mix between 300g and 500g. 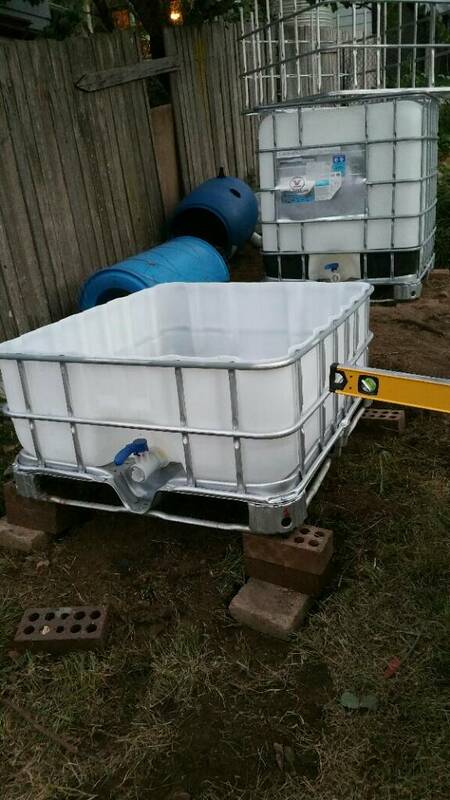 I have one 40cm deep growbed and a mbbr with around 150l of k1 in it. This should be more then enough to cover the bio filtration until i can get the other beds built and online. The next task will be adding another ibc as a fish tank so i can move the remainder of my fish over. 12 smaller perch and 4 cat fish. Any tips on what i can use to reinforce the under side of an ibc top that is going to being used as a growbed? I was thinking of using two 200 x 50mm treat pine sleepers. One on each side of the lid. a pine pallet is fine and easily does the job. partly because you can get some deformation in the IBC when cut, and/or sag if wood gets wet/damp. Four 100/75x50 would be OK as it would spread the load - and could be on edge for less sag. A partially deconstructed pallet with cross planks nails it very easily as the top planks add rigidity and support. I roll the separator/bearer planks 90 degrees so on side and not as high. Thanks dlf that sounds like a plan a pallet will be cheaper then 2 sleepers as well. Now to find some cheap pallets that are either hardwood or treated. In this system i have made sure all of my beds are not over the sump or fish tank. It was a pain with my last system making sure there would be no runoff into the tanks below. Here is the progress so far for bed #2.